'When you know nothing you say a lot; when you know something there is nothing to say.' U.G. Parveen's first breakdown is an old story. I wonder if anyone can imagine what it is like to live with a person who is going mad. Parveen's madness, the threat from the film industry to get her back in front of the camera at any cost, the psychiatrists throwing up their hands, her mother yielding to the pressure for shock treatment—God, what a mess it was! 'There must be an end to this misery,' I said to myself then. 'For God's sake, help us,' I cried out to U.G., 'We are at the end of our rope.' My mood was such that I was ready to follow him over the wall and even venture to assay the first jump, if he so commanded. U.G. did come to our rescue and he shielded us from all those pressures. Even now, I feel guilty for imposing my problems and Parveen's illness on him. I engulfed him in our private hell. How can I ever forget that every time I sought his help, he stretched out his hand! And he was even blamed for it by the media. In September 1979, I shanghaied Parveen to Kodaikanal where U.G. was spending a month. Being there with U.G. helped her. Her condition was slowly improving. All her fears that somebody wanted to kill her gradually dissipated. U.G. was like a solitary tree in a wasteland, sheltering us in its shade so we could breathe a while... But not for long. Soon Kodai turned out to be something like a page from Dante's Inferno. Parveen locked herself up in her room and would come out only to have her meals. U.G. too was not well because of his cardio-spasms. He just couldn't eat or drink anything for thirty-six hours. To make matters worse, Parveen too stopped eating and drinking—perhaps a sympathetic response to U.G. 's condition. The damp, cold, wet weather added to our discomfort. Suddenly, one night, a gripping pain seized U.G. Looking at his friend Valentine, he said, 'It looks like the time has come for me to go.' To this Valentine remarked, half-jokingly, 'U.G., I don't think it is practical to die in a place like this, at a time like this.' U.G. burst into laughter—that was the only laughter that echoed within the four walls of that cottage in a week. That outburst of laughter freed U.G. from his difficulty, much to everybody's relief. The last seven days I spent in Kodai were the most harrowing, agonizing, vexing and tormenting I have ever had. I think I was more deeply depressed than anybody there. One evening, when it was almost midnight, U.G. was in the living-room alone, watching the fire glowing in the fireplace. As I joined him I was in a troubled state of mind over the uncertainty of Parveen's and my future together. U.G. sensed my anxiety, sadness and despondency. He said he saw little chance of complete recovery; that all mental maladies were genetic in origin. 'The psychiatrists know it too. But they won't admit it. It would put them out of business.' U.G. suggested that we leave for Bangalore and seek the help of his friends at the Institute of Mental Health. In Bangalore, Parveen's condition improved. I had heard intriguing stories about U.G. 's walks with the king cobras. I had dismissed these stories as myths but was nevertheless curious. So, one day, at Mr. Brahmachari's ashram, I said to U.G., 'I hear that you go for walks with a king cobra. This I would like to see.' U.G. responded saying, 'We will see.' Late that same evening Parveen and I went for a stroll with U.G. As we were walking along, all of a sudden, U.G. said, 'Stop,' and holding us both back said, 'Look and see for yourselves.' There they were—not only the king cobra, but the whole family. Parveen and I ran away in terror. The cobra would only strike if it sensed fear. A frightened being emits odors. The cobra strikes in order to protect itself. It does not trust human beings. It may kill one human being to protect itself, while humans kill hundreds of cobras for no reason. Naturally, when this happens the field mice have a field day with the crops in the field, because there are no cobras left to eat them. That was some lesson on ecology! I still remember the day when U.G. spoke to me about distancing myself from Parveen. 'I know it's going to be tough, Mahesh,' he said hesitantly, 'but make possible what is inevitable...' I knew the end was near. Strange as it may seem, U.G. had in a way prepared both Parveen and me for this separation. It was in Gstaad, Switzerland, on a quiet morning that U.G., seeing Parveen's palm, predicted a break in her career. She was right on top in those days. He also predicted the termination of our relationship. The manner in which he said it seemed frivolous but somewhere within both of us a feeling of impending doom surfaced. For months Parveen woke up in the middle of the night staring at her palm terrified. She tried to prevent me from meeting U.G. whenever he passed through Bombay, saying, 'He will take you away from me. Don't meet him. Don't you see, he wants us to break up?' U.G. persuaded Parveen to save money for what he called a 'rainy day'. How helpful those savings are to her now! Jinarajadasa returned to India toward the end of 1940. He opened the facility built by U.G. 's grandfather for the use of the Andhra Theosophical Federation as its Headquarters. He stayed with U.G. 's family in their home for two days. This was in January 1941. That Summer, U.G. worked in C. W. Leadbeater's personal library, rearranging his books for almost three months. He had always wondered how Leadbeater wrote about the past lives of Krishnamurti published under the title, Lives of Alcyone. When U.G. looked at the collection of books Leadbeater had in his personal library, he said to himself, 'He has read all the ancient histories of practically every civilization in the world. No wonder he could fit Krishnamurti's past lives into these histories.' That confirmed his skepticism about Leadbeater's powers of clairvoyance which he was credited with by the members of the Theosophical Movement. As a child U.G. sat in front of Leadbeater every day expecting that he would clairvoyantly see some spiritual potential in him. To his disappointment, Leadbeater never showed any such recognition. Thank you for your letter dated July 8th. I quite realize that examinations are a very great nuisance, and are indeed of extremely little worth. But one has to go through them for the sake of equipment from the standpoint of the outer world. We were very glad to have you here in the Office and hope to see you again when you are next in Madras. I am so sorry you have failed in your examination again. Some of us are not really fit for examinations. We can do other and better things. And if you have an income which will suffice, then why should you not follow your own inclinations and study along your own lines? For my own part, I should not think it is necessary for you to have a university career. Although I was a student with the lowest grades, barely passing grades, I was admitted into the Philosophy Honors class at Madras University. These courses were primarily for brilliant students. Though I wasn't brilliant, the professor of Philosophy needed students. There were only four students in the class, so he admitted me. Because of my lack of interest in the studies, he always joked that he had four-and-a-half students in his class. I never attended any mid-term examinations, let alone the final ones. My report card revealed nothing but absenteeism. One day the Principal sent for me and confronted me with my last report card. I had struck off the 'Parent or Guardian' entry and signed it myself. The Principal said that I should get the signature of my grandfather. If I failed to do so, he would fine me twenty-five rupees. I said that wouldn't hurt anybody and that I could write a check immediately for that amount drawn on the Imperial Bank of India (the bank for Government agencies and rich people). The Principal asked me, 'Why are you attending this college, then?' I said, 'For want of a better occupation.' He was not impressed. He insisted that I should still produce the report card duly signed by my grandfather. Luckily for me and unfortunately for him, the principal died of a heart attack the next day. It was during that time I discovered Time magazine. (I continued to read it from cover to cover for 50 years and enjoyed its style and coverage of world events.) That was when I discovered that there is no such thing as objectivity and an unprejudiced view of human affairs. Those were the War years. The magazine used to arrive six months behind schedule. But we followed the course of events of the war from day to day through the B.B.C. and the daily newspapers. I have heard about your reactions with reference to the Theosophical Society and Krishnaji—how critical you have become of everything and everybody! I should like to know your exact viewpoint and would certainly like to discuss it with you. I suggest that you contribute a series of articles in the Theosophist. You can very freely criticize anybody—the President, the General Secretaries, and anybody else, in support of your position. Such articles would be welcome in order to maintain absolute freedom on the platform of the Theosophical Society. It is only by such frank and free expression of opinions that organizations can retain their vigor and vitality. If you feel that the Theosophical Society should be closed down, say so in the articles. Let the members know it and let them begin to think. I feel that I at any rate will be greatly benefited. Yet, in response to this, U.G. told him of his intention to resign his membership from both the Theosophical Society and its Esoteric Section. Jinarajadasa was disappointed. He said that he was leaving soon for the United States and that he would be back in India before the end of the year. He wanted to discuss the matter further with U.G. then. But he died in America in July, the same year. U.G. continued his lecture tour for the Theosophical Society in Europe. At Oslo, he addressed the One World Movement. At a German Summer School at Rendsberg, he was the guest of honor and gave a course of lectures on 'Man, Nature and Reality'. At the invitation of the General Secretary of the Council of the Theosophical Society in Europe, which was celebrating its Golden Jubilee, he attended the Council meetings and addressed them on Indian ideals of life and thought. He also gave a public lecture in Brussels, Belgium. The audience consisted of twenty-eight people—twenty-five out of whom were old women in tennis shoes, knitting sweaters. It was then that U.G. said to himself, 'Is this how I am going to serve the cause of Theosophy and the Theosophical Society? All this is second-hand information. Anybody who has brains can gather this information and then throw it out. This is not something real for me. What am I doing? Why am I wasting my time?' Given below is U.G. 's opening address to the German Summer School at Rendsberg in July 1953. The history of Theosophical thought is the history of the evolution of modern thought. As of all others, the survey of Theosophical thought in successive periods of the Society's history is the general evolution and progress of human thought. The leaders of the Society have a place not only in the Theosophical Movement, but also in the history of world thought itself, in the whole intellectual advance that has been registered these seventy-seven years. Every leader has contributed to this onward and forward movement some small fresh fragment to the Temple of Theosophical Wisdom. Progress always appears in different lights to different people. The Society is not simply a working institution; it is a spiritual organization. It is different from the ordinary human societies or clubs that men form for ordinary purposes of human association; but it is still a Society composed of people of various nationalities, and therefore, not something that you can talk about in the abstract. It is like any other organization made up of members. Sometimes in the life of any spiritual movement, we seem to be just jogging along; nothing very much appears to be happening and we do not seem to be getting anywhere in particular; it is only when we pause to look back and to take our bearings, that we realize what a long way we have, in fact, come from where we started, and what tremendous advances we are really making. There is bound to be loss as well as gain but the leaders have, during these seventy-seven years, made significant contributions in and through the Theosophical Society, to the religious life of the community as a whole. Each of them had something new to say and that is why we revere them, but each of them in a different fashion proclaimed a different facet of Theosophy and they carried the Society forward with them because they journeyed with their faces towards the light. They have left their mark upon its outlook and activities and have also helped to set the general tone. Let us look at the different stages of growth and the gradual objectivization of the ideals of Theosophy. Let me very briefly survey the background of the Theosophical Movement and the conditions of the world before its advent. The world was then divided into two camps, that of rigid materialism and that of a narrow and bigoted form of religion. It was an age of conquering science when religion was on the defense. The increase of 'valid knowledge' called Science was having a disturbing effect on the religious traditions. Religion had become bankrupt, for it had no real life in it. The mechanistic theory of man and the Universe grew in clarity and prestige. The philosophy that emanated was a materialistic philosophy which sought in matter the solution of all mysteries. Into this maelstrom of opposing and conflicting forces was heralded the Theosophical Society. Thus what was wanted, the Theosophical Society supplied. So the work of H.P. Blavatsky is of great consequence, as she supplied a philosophy of life which was broad enough to include both spirit and matter. The great Theosophical treatise, The Secret Doctrine, by Madame Blavatsky, brought together all sorts of facts in the domain of mysticism, religion, philosophy and science to prove that quite apart from science and religion, dogma and worship, there is one step beyond mind touching spirit, which may be called the transcendental aspect of Theosophy. She tried to establish the Law of Reincarnation, the Theory of Karma, the power of mind over matter, and she stressed the practice which, in fact, is Occultism. It appealed to the intellectuals of that time and so she was able to gather around her great personages like Edison, Sir William Crookes, Alfred Russell Wallace, W.T. Stead and Sir Oliver Lodge, though they dropped out of our ranks later. Thus the early efforts of H.P.B. proved the supremacy of spirit over mind. 'The philanthropist is relatively safe when he acknowledges safely to himself the elements of satisfaction in his work. The person who says: "I give freely and look for no return; I wear myself out for the sake of others; I accept honors and responsibility unwillingly; the money I receive for my work is nothing to me; I do not want gratitude" is being hoodwinked by his unconscious. People do not consider it decorous to realize that they are doing more interesting work and getting better pay than ever before, an outlet for their energies and many are the better for it.' Why the urge for service at all?... Dr. Besant taught us that life is only for service. She stressed the central truth as distinct from dogmatic and institutional forms. This appealed to the modern mind, which was becoming increasingly rationalistic in temper and outlook. She made the evolving Universe intelligible to millions of people and from the heights of her idealism she set in motion thought currents which spiritualized them more than any other single influence. Leadbeater helped us to see the other worlds to which we also belong, the worlds invisible and intangible. Our citizenship is also in Heaven. The unseen world is only an expansion of that which is seen. There is one more contribution of his. At the time of the inauguration of the Theosophical Society the adepts did not use the phrases 'The inner Government of the world', 'The Ideas of Manu, the Bodhisattva and the Logos'. These were all later revelations. These were elaborated by the investigations of Annie Besant and C. W. Leadbeater from whom we also heard of the Monad, the Group Soul, etc. Immediately following World War II and continuing down to the present, this country has spent millions of dollars in underdeveloped countries in an attempt to keep them from falling prey to the clutching hands of Russian imperialism. Unfortunately, when the balance sheet has been drawn up it shows that this country is operating in the red and the country receiving the aid is being operated by the Reds. Only a few days ago a highly educated man from India—one of the countries which has received millions of American dollars and still refuses to ally herself with the Western nations—made some statements in a speech in Elgin that were freighted with truth and worthy of profound consideration. U.G. Krishnamurti was born and has lived most of his life in India—with the exception of the months he has spent traveling and lecturing, much of it in this country. Krishnamurti points out that this country would be better off if she would stop spending money in India and utilize it in other directions. The masses of India—who are in the main ignorant of America's financial help to their country—would appreciate our position more if money were spent on such projects as bringing Indian patients to this country for treatment in American hospitals, and by American doctors; sponsoring Indian farmers who could get a first hand view of an American farm, or letting an Indian industrial worker see our assembly lines in action and visit the home of an American worker. Speaking at the Lion's Club here Tuesday, U.G. 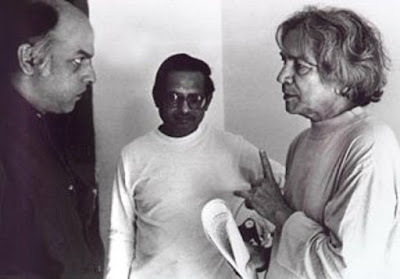 Krishnamurti, one of India's most accomplished lecturers, pleaded for greater understanding between India and America. After thanking the club for the invitation, Krishnamurti paid an eloquent tribute to the Lion's International for the very valuable work it is doing here in this country and elsewhere, and added that such movements could be the greatest forces in a world which is full of misunderstanding, acrimony, discord and prejudice. Toward the end of this period of lecturing , U.G. began wondering why he was doing this, that there must be some other way of making money. He, however, had no alternatives in mind. He knew only how to 'squander' the money he had inherited. He finally told his manager that he did not want to go through with the lecture tour she had arranged for him for the following year. 'You have now become a celebrity of sorts,' she said, 'You are in demand. How can you do this to me?' 'Sorry,' said U.G.